In Professor Greenwood’s Problems of Practice course, undergraduates (such as Charlotte Maxwell ’17, above) studied archives to trace family histories and unlock stories behind William Bullard’s turn-of-the-century photographs. The Dillon family sits for a portrait in their home in Worcester’s Beaver Brook neighborhood. It’s 1904, and their neighbor, a photographer named Charles Bullard, perches behind the camera. 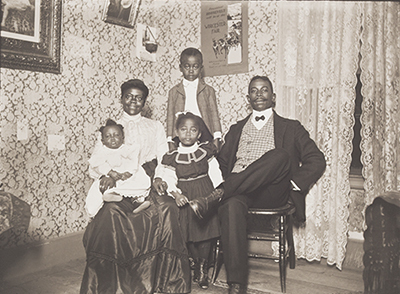 This 1904 photograph of the Dillon family of Worcester appears in the Worcester Art Museum’s current exhibition of William Bullard’s photographs. The African-American Dillons — Thomas, Margaret and their three children — are dressed in their Sunday best. Their parlor displays an air of middle-class respectability: lace curtains, wallpaper, framed portraits — and a poster of President Theodore Roosevelt’s 1902 visit to Worcester. Why did the Dillons revere Roosevelt? Why did the 26th U.S. president visit Worcester? And did the parlor’s appearance indicate that the Dillons were economically well off, or that the coachman and his wife aspired to rise into the middle class? These are just some of the questions that sparked conversations among 10 undergraduate students, their professors and several area residents last spring in “Public History: Race, Photography and Community,” a Problems of Practice history seminar at Clark University. In the course, taught by Janette Greenwood, professor of history, and Nancy Burns, associate curator of prints, drawings and photographs at the Worcester Art Museum, the students researched nearly 20 of the 225 photographs Bullard took of his neighbors from the Beaver Brook area of Worcester. More than 80 of the photographs are on display as part of the exhibition, “Rediscovering an American Community of Color: The Photographs of William Bullard,” which runs through Feb. 25, 2018, at the museum. Greenwood, Burns and Frank Morrill, a local historian who owns Bullard’s collection of 5,400 photographs and glass negatives, have been working on the exhibition for nearly four years. Bullard, who was white, lived several years in the racially and ethnically mixed neighborhood of Beaver Brook, home to African-Americans from the South, Native Americans from the region, and immigrants from all over the world. Read more about the discovery of William Bullard’s photographs, the involvement of Professor Janette Greenwood and her students, and the exhibition at the Worcester Art Museum. In the POP course, each student researched at least one photo and interviewed the descendants of Bullard’s “sitters,” as the people in the portraits are called. Their research informs essays on a student-created website about the Bullard exhibition, as well as the labels accompanying some of the photographs hung at the museum. The students also blogged about their experience for the museum’s website. In May, the students made their final presentations in anticipation of the exhibition. By focusing their Power Point talks on a classmate’s findings, each student practiced presenting research about a photograph. Many of the students, including several 2017 graduates, will attend the museum’s Master Series Third Thursday event on Oct. 19 and be available for questions about the photos they researched. So why did the Dillon family display the Teddy Roosevelt poster? 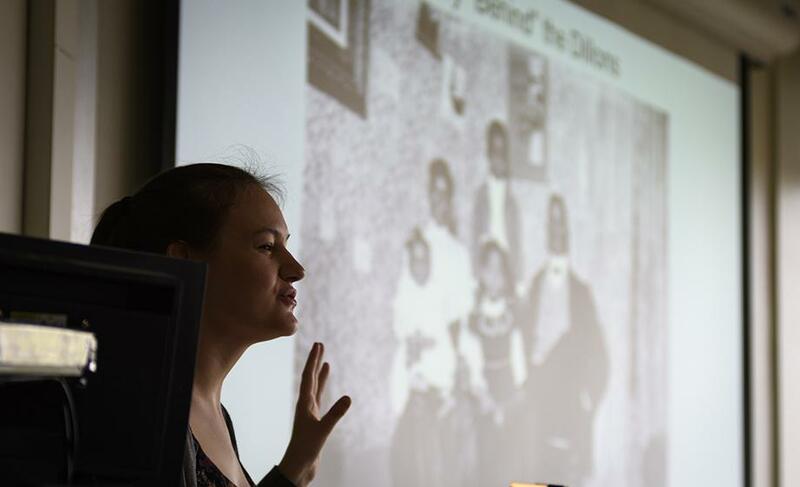 “Many African-Americans remained loyal to the Republican Party at the turn of the century because they associated the party with Lincoln, emancipation and hope,” Charlotte Maxwell ’17 explained during her presentation of research by her classmate and fellow history major, Stefan Sprinckmöller Alayza ’17. The poster commemorated Roosevelt’s visit two years earlier as a guest of the Worcester Agricultural Society, where more than 25,000 people greeted him. “Never since the first settlers staked out their home sites were there so many people in Worcester in one day,” the Worcester Spy newspaper reported. Roosevelt would return in 1905 to give Commencement speeches at Clark and Holy Cross. After Maxwell’s presentation, the class, along with Morrill and several descendants of Bullard’s sitters, discussed and analyzed the photo — the Dillons’ dress, their facial expressions, and the interior of their home. Yet Greenwood cautioned the students not to assume too much about the family. 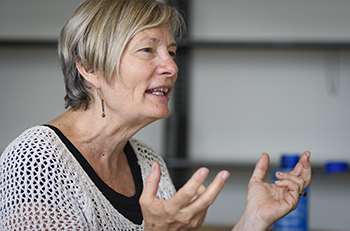 “It’s important to make some of these subtle distinctions about what we know and don’t know,” she said. Sprinckmöller Alayza’s research about Roosevelt met the goal of the assignment, she added. “It’s not just an antiquarian exercise about one family in Worcester, but it’s about a much larger national story taking place,” Greenwood said. “This is a model of starting with the particular, teasing out the local context and connecting it to the national.